* Thickened pure aluminum light body, ABS housing, strong and durable, rapid heat dissipation. 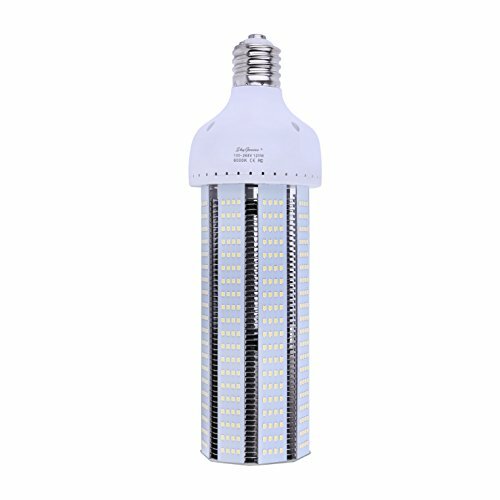 Low quality LED bulb can't stand high temperature and dead easily. Also great for garage, parking lot, post light, warehouse, barn, patio, courtyard , garden, street, office, school, hospital, shopping mall, supermarket, station, restaurant, hotel, workshop etc, anywhere need bright light. *When used in HID lighting or other types of fixtures, 100V input voltage must be wired directly to the socket. Ballasts and capacitors must either be bypassed or removed by a qualified electrician. *This bulb is not waterproof. *Enclosed environment No RECOMMEND.But if you need to use the light in closed environment,you may detach the transparent case cover which will help to protect the light better and long lifespan. If you have any questions about this product by SkyGenius, contact us by completing and submitting the form below. If you are looking for a specif part number, please include it with your message.